ASTRO BOY, originally named Tetsuwan Atom, was created in 1951 by Japanese cartoonist and animator Osamu Tezuka, only six years after the end of World War Two. The original ASTRO BOY comic book series was wildly popular and runs almost 5,000 pages. In 1963, twelve years after the comic book series was introduced, Tezuka launched a black and white animated TV series of ASTRO BOY. As Japan was recovering from the ravages of war, ASTRO BOY, a child-robot with super-powers, captured the imagination of a nation in need of hopes and dreams. The original ASTRO BOY television series was broadcast in more than 50 countries. In 1980 a second TV series was made, this time in color, and in 2003 a third TV series was made using CG animation. As created by Tezuka, ASTRO BOY is a robot created by a brilliant scientist as a substitute for his son who was killed in a traffic accident. The scientist gives ASTRO BOY his super powers - eyes like searchlights, ears that hear for miles, fingers enhanced with lasers, limbs that fire rockets and the ability to fly! But, along with these powers, ASTRO BOY also has a soul, a conscience and human emotion. Caught between humans and robots, ASTRO BOY experiences various difficult situations but grows up by overcoming the problems he faces. 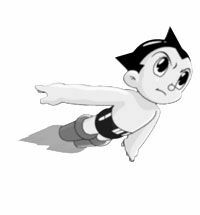 Three generations ago, ASTRO BOY ignited the imaginations of millions of Japanese children. Some of these same children became leaders in culture and industry, particularly in the field of robotics. ASTRO BOY had a major impact in a country searching for its future. And, this child-robot with a soul continues to inspire new generations of robot makers around the world. ASTRO BOY, we salute you on your induction into the Robot Hall of Fame!